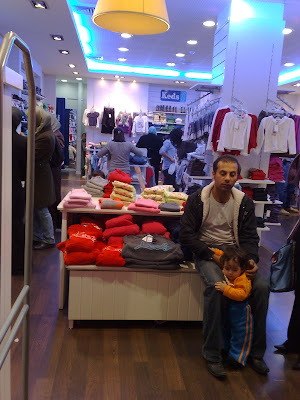 More on Arabs Refuting the Big Lie of "Israeli apartheid"
We have already shown [here] photos of Arabs rubbing shoulders with Jews in a Jerusalem shopping mall, enjoying the amenities of the mall and the joy of shopping, a favorite activity of mankind in the 21st century. Shopping is a joy for Arabs as much as for any other people, if not more so. The shopping mall in Dubai is reputed to be the biggest, the grandest, the most splendid in the world. 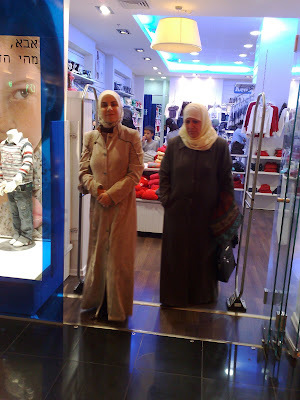 Here are a few more photo shots of Arabs enjoying shopping in Jerusalem. While doing so, unconsciously or not, they are disproving the Big Lie of "Israeli apartheid," a favorite of the fanatic Judeophobes in the West and of those whose minds have been "bent," so to speak. These Arabs are refuting the Big Lie, arguing with their feet, as it were. The lie itself is most likely an invention of Western psychological warfare agencies and experts, probably British. 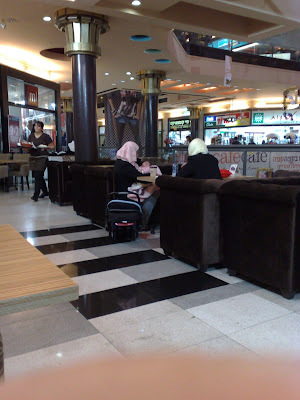 Here are two Arab-Muslim women in the full headgear and robes sitting in a restaurant in the mall and eating. One is caring for a baby. A Jewish waitress is seen at left. Arab women are seen happily shopping, going through piles of clothes in a shop. Look at the back of the store and to the left. Arab-Muslim women are most easily identified by their distinctive garments. Two happy shoppers leaving a store. Actually, the younger woman on the left seems quite happy and satisfied, the older woman not so much. Note the Hebrew writing on an advertising poster to the left of the younger woman. Here is empirical evidence that these Arab women are not suffering "apartheid" in Israel. Nevertheless, the fanatic true believers in the West in inherent Israeli evil, the heirs of 17 centuries of Judeophobic indoctrination, of the demonization and dehumanization of Jews, will probably not be swayed by mere empirical facts. We bear in mind that most of those groups and individuals called "Left" or "leftist" in the world today share that destructive Western mental heritage. Most of the "Left" today in countries like Britain, the USA, Sweden and Norway, as well as some other Western countries and some Eastern and African countries under Western cultural-intellectual influence (especially British), is a manipulated body of public opinion. Despite Marx and Engels' claim that they were devising a "scientific socialism," they could not or would not shake the rigid influence of Kant and Hegel, particularly the Judeophobia of these two philosophers. Many of Marx and Engels' self-described followers today are incapable of logical reasoning, of empirical induction, or of rational thought. They believe more in comfortable slogans that they have indoctrinated [or inoculated?] with than in the evidence of their own eyes. Psychological warfare techniques and mass psychological manipulation are dominant tools in shaping contemporary public opinion. For more on this topic, see here.